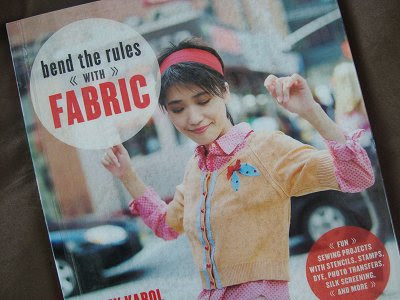 Yep, you've caught me hiding away in my room having a quick peek at Amy Karol's latest book, "Bend the rules with fabric". 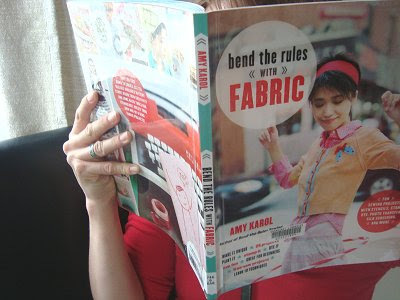 Amy Karol is also the author of "Bend-the-Rules Sewing", so when I heard she had another book out, I knew it would be great and quickly emailed my local library to order a copy in. I haven't had time to read it all yet (thanks to our rather crazy week this week), but have already been rather impressed with all the cool ideas for things you can do with fabric... printing on, painting, dying, drawing and stamping fabric - it's a very inspiring book and one that I would love to own for myself one day. Definitely a book I would recommend for any craft junkie! Are you hiding behind your curtains again? That book looks very cool. Nope - but what a good idea! Cool looking book alright! I must sniff out good finds like that at our library!